Temescal Alleys Off 49th St.; ½-block east of Telegraph Ave. These alleys are lined with unique shops that are perfect for gift-hunting, plus casual snack stops for refueling. They are pedestrians only. Originally the narrow roads were home to stables for trolley horses. ●Ali Golden #470-E, (805) 340-7086. This sparely furnished designer boutique displays a casual women’s clothing line, all of which is Bay Area-made. ●Crimson 470 49th St., (510) 992-3359. Stuffed with botanical delights, this shop has a large selection of air plants and potted items as well as lovely botanical body products, vintage gardening books, and plenty more. ●Curbside Creamery #482, (510) 250-9804. Regular dairy as well as cashew vegan ice cream is available in cones or sandwiches. ●Homestead Apothecary #486-C, (510) 495-6549. You’ll find everything for what ails you here—elder flowers, Echinacea, gingko leaves—plus lovely botanical cards and a few other related items. ●Marisa Mason #484-D, (510) 325-0019. Jewelry is handcrafted using original designs right in the studio in the back of this shop. ●Temescal Alley Barbershop #470-B, (510) 761-5074. No reservations. Men and women alike line up on the bench outside, waiting their turn to sit in the antique chairs of this old-style barbershop. Haircuts, beard trims, and straight-razor shaves are the specialties. ●Walrus #470-G, (510) 545-9784. Home accessories here are repurposed, used, and vintage items. You’ll find everything from felt dryer balls to sturdy antique school chairs. ●Doughnut Dolly CLOSED #482-B, 9510) 338-6738. It’s hard to believe, but only one thing is sold here—hand-rolled doughnuts dusted with either granulated or powdered sugar. You get a choice of four fillings pumped in by hand from funnel dispensers. I chose their signature Naughty Cream, which is a thick mixture of vanilla bean and crème fraiche, but Mexican chocolate and a couple of others were also available. When they run out of a flavor, there is no more available that day. Owner Hannah Hoffman is a graduate of the Chez Panisse kitchen. ●Esqueleto #482-A, (510) 629-6216. Tu-Sat 11am-6pm, Sun 11am-5pm. This shops owner relocated here from New York with her namesake line, Lauren Wolf Jewelry. In her desert-like gallery she represents both local and international contemporary jewelers, ceramicists, and fine artists. Art shows change regularly. ●Ruby’s Garden 5026 Telegraph Ave., (510) 595-5325. M-Sat 10am-6pm. This gigantic one-room shop has a vast inventory of children’s items. Prices are good, and many items are unusual. Some used items are also for sale. Bring new or gently used children’s books to donate to their collection bin for the East Bay Children’s Book Project. ●Sagrada 4926 Telegraph Ave., (510) 653-7196. Tu-Sat 10am-5pm, Thur to 7pm. 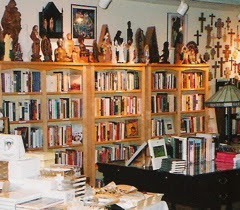 This shop devloted to sacred arts stocks books, religious art and crafts, and gifts representing all faiths. What a great find for shoppers intent on discovering something unique and unusual. I love that you're giving Oakland its due. Can't wait to check out this neighborhood the next time I'm there. Looks like a lot of interesting shops worth investigating on Temescal Alley! I am just not a shopper at heart, but a funky little street like this with such interesting shops might just tempt me. Yes, this street is a great browse. And there are many inviting restaurants in the area. I wonder where the name Temescal Alley originates from? In Mexico and Guatemala it's a Mayan steam bath which seems to have no relation to trolley horses! At any rate, it looks like a fascinating place to visit! An interesting question. Perhaps before the horses. First, sorry for my delayed comment on your post last week. Wifi problems in Europe were not fun. I did not know about these neat little towns around Oakland. To think my sister lived there for five years and I visited her a lot! Neat shops! What a great little street for shopping or browsing. Hey, this looks cool. I never would have thought of getting out of Berkeley for a day to shop Oakland! I don't like to shop but this looks like a cool neighborhood to do some window shopping. Always fun to find unique items, love pedestrian only alleys/streets. The Curbside Creamery definitely sounds like a place to make a stop at! What a cool little slice of Oakland. It's a city that can be totally surprising, as I was discovering the art galleries around Telegraph Avenue and Broadway between Jack London Square and 27th Street. I really must get across the bay and check out the Temescal Alley shops. What a fascinating selection of shops! I like the idea that they're housed in old stables - it makes the area seem so interesting to wander around. You'll need to be very creative to see the old stables.